Funds allow you to allocate credits toward specific purchases. In the funds interface, you can create funds; allocate credits from funding sources to funds; transfer money between funds; and apply fund tags to funds. Funds are created for a specific year, either fiscal or calendar. These funds are owned by org units. At the top of the funds interface, you can set a contextual org unit and year. The drop-down menu at the top of the screen enables you to focus on funds that are owned by specific organizational units during specific years. To create a new fund, click Admin → Server Administration → Acquisitions → Funds. Enter a name for the fund. No limits exist on the number of characters that can be entered in this field. Create a code for the fund. No limits exist on the number of characters that can be entered in this field. Enter a year for the fund. This can be a fiscal year or a calendar year. The format of the year is YYYY. Select an org unit from the drop-down menu. The org unit indicates the organizational units whose staff can use this fund. This menu is populated with the shortnames that you created for your libraries in the organizational units tree (See Admin → Server Administration → Organizational Units). Select a currency type from the drop-down menu. This menu is comprised of entries in the currency types menu. When a fund is applied to a line item or copy, the price of the item will be encumbered in the currency associated with the fund. Click the Active box to activate this fund. You cannot make purchases from this fund if it is not active. Enter a Balance Stop Percent. The balance stop percent prevents you from making purchases when only a specified amount of the fund remains. For example, if you want to spend 95 percent of your funds, leaving a five percent balance in the fund, then you would enter 95 in the field. When the fund reaches its balance stop percent, it will appear in red when you apply funds to copies. Enter a Balance Warning Percent. The balance warning percent gives you a warning that the fund is low. You can specify any percent. For example, if you want to spend 90 percent of your funds and be warned when the fund has only 10 percent of its balance remaining, then enter 90 in the field. When the fund reaches its balance warning percent, it will appear in yellow when you apply funds to copies. Check the Propagate box to propagate funds. When you propagate a fund, the ILS will create a new fund for the following fiscal year with the same parameters as your current fund. All of the settings transfer except for the year and the amount of money in the fund. Propagation occurs during the fiscal year close-out operation. Check the Rollover box if you want to roll over remaining funds into the same fund next year. You should also check this box if you only want to roll over encumbrances into next year’s fund. Credits can be applied to funds from funding sources using the fund interface. The credits that you apply to the fund can be applied later to purchases. To access funds, click Admin → Server Administration → Acquisitions → Funds. Click the hyperlinked name of the fund. To add a credit to the fund, click the Create Allocation tab. Choose a Funding Source from the drop-down menu. Enter an amount that you want to apply to the fund from the funding source. The credits that you allocate to funds can be transferred between funds if desired. In the following example, you can transfer $500.00 from the Young Adult Fiction fund to the Children’s DVD fund. Click the hyperlinked name of the originating fund. The Fund Details screen appears. Click Transfer Money. Enter the amount that you would like to transfer. From the drop-down menu, select the destination fund. Add a note. This field is optional. The Fund Details allows you to track the fund’s balance, encumbrances, and amount spent. It also allows you to track allocations from the funding source(s), debits, and fund tags. To access the fund details, click on the hyperlinked name of the fund that you created. Balance - The balance is calculated by subtracting both items that have been invoiced and encumbrances from the total allocated to the fund. Total Allocated - This amount is the total amount allocated from the Funding Source. Spent Balance - This balance is calculated by subtracting only the items that have been invoiced from the total allocated to the fund. It does not include encumbrances. Total Debits - The total debits are calculated by adding the cost of items that have been invoiced and encumbrances. Total Spent - The total spent is calculated by adding the cost of items that have been invoiced. It does not include encumbrances. Total Encumbered - The total encumbered is calculated by adding all encumbrances. A core source, Fund Summary, is available in the reports interface. This core source enables librarians to easily run a report on fund activity. Fields that are accessible in this interface include Remaining Balance, Total Allocated, Total Encumbered, and Total Spent. Edit a fund just as you would edit a currency type. The Fiscal Year Close-Out Operation allows you to deactivate funds for the current year and create analogous funds for the next year. It transfers encumbrances to the analogous funds, and it rolls over any remaining funds if you checked the rollover box when creating the fund. To access the year end closeout of a fund, click Admin → Server Administration → Acquisitions → Funds. Click Fund Propagation and Rollover. Check the box adjacent to Perform Fiscal Year Close-Out Operation. 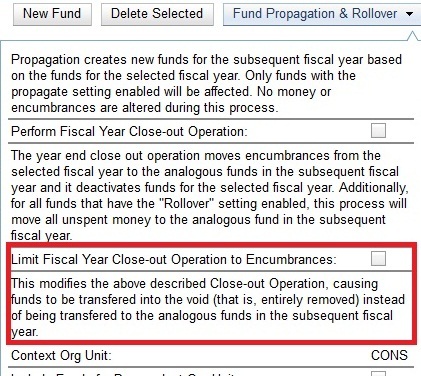 For funds that have the "Rollover" setting enabled, if you want to move the fund’s encumbrances to the next year without moving unspent money, check the box adjacent to Limit Fiscal Year Close-out Operation to Encumbrances. The Limit Fiscal Year Close-out Operation to Encumbrances will only display if the Allow funds to be rolled over without bringing the money along Library Setting has been enabled. This setting is available in the Library Setting Editor accessible via Administration → Local Administration → Library Settings Editor. Notice that the context org unit reflects the context org unit that you selected at the top of the Funds screen. If you want to perform the close-out operation on the context org unit and its child units, then check the box adjacent to Include Funds for Descendant Org Units. Check the box adjacent to dry run if you want to test changes to the funds before they are enacted. Evergreen will generate a summary of the changes that would occur during the selected operations. No data will be changed. Evergreen will begin the propagation process. Evergreen will make a clone of each fund, but it will increment the year by 1.